Well here are some pics of my knitting a few minutes ago to show proof of my knitting. 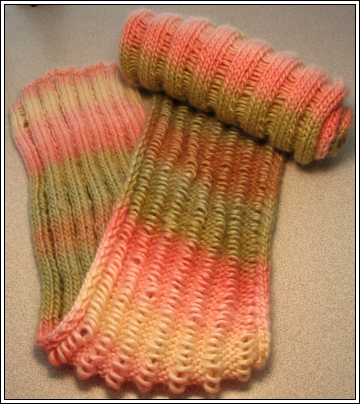 Well start off with the Patons SWS Drop Stitch Scarf. I've decided it will be my first item to go into my Dulaan box. :D I've committed myself to 5 projects. I actually finished this a few weeks ago but haven't had time to post it. Next up are my socks. 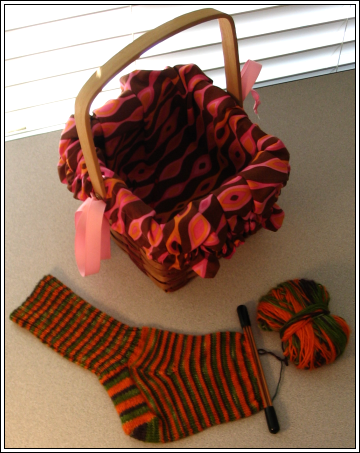 I'm almost done with sock #1. 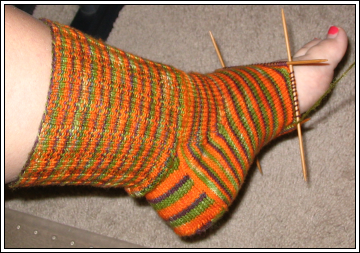 Although I won't have the whole pair done by the end of October I will have ONE sock done! That's something. Oh hush. Finally I will say that my Gifted Upon Partner in the Knitters Tea Swap got her package. She got it a while back, but I've been busy/sucked/dead so I didn't mention it until now. Julie is a lovely gal and was a fun partner. :D Go check out her blog for all the gifties I sent her. It was muchly fun! I vote you just fall over, but that's my plan for the afternoon. You know, I am SO lovin' that Paton's stuff. I wish we had a place that sold it around here. Too many snobby yarn shops. Yarn remover = sandpaper. Works for me. I was wondering about that SWS. It's a beautiful scarf! so i took your pattern and knit my own scarf.